Three days ago, everything was going very well. Our plan going down the ICW was to travel south from Coinjock, NC (mile 50), anchor the first night in the Little Alligator River (mile 101), anchor the second night in the Pungo River (mile 140), and then make it to Oriental, NC for the third night (mile 182). We planned our passage to get to Oriental on the third night because high winds were predicted and we didn’t want to be at anchor. It looked like we were going to arrive on schedule. The first day nothing much had happened. We had been quietly motoring all morning, charging our phones, and hanging out in the cockpit. Getting from Albemarle Sound to the Little Alligator River requires passing through an area called Middle Ground. It is a very narrow channel, with constantly shifting shoals on each side. The channel is clearly marked, but right outside of the marks is extremely shallow water. We got through easily though; we were not sailing, so we didn’t have to worry about where the wind was coming from. My dad was at the helm, while my mom watched the depth gauge and Nicole and I stood by. We motored right on through without a hitch. My mom grabbed the helm as we continued to lose speed and drift forward, and the rest of us rushed below to find white smoke filling the cabin and something spraying out of the galley cabinet. We still had no idea if the boat was on fire, and we pulled open the floorboards to reveal the engine, and more white smoke rushed out. To our relief, we saw that the engine was not burning. The white smoke was actually overheated engine coolant. We jumped into action, and within a minute or two of losing the engine, we had raised our sails. It was lucky we were in the Little Alligator River; unlike most of the ICW, it’s deep enough for us to sail in many places. 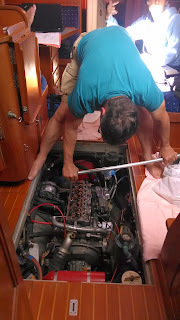 Mom and I sailed the boat while my dad worked on the engine and Nicole cleaned up. It turns out that an alternator bolt had snapped off, letting the alternator come loose and letting the belt connecting it with the water pump fall off. The water pump cools the engine, so without it the engine overheated and blew a head gasket. We had no idea this was happening, because the high temperature alarm never went off. Had we known, we would have stopped the motor and saved it from the damage. However, we didn’t, our engine was dead, and we were stuck in the middle of nowhere. Sailing along south, it took us two hours to figure out what the problem was and figure out what we should do about it. We had two options. One was to continue south. However, ahead of us was the 22 mile long Alligator-Pungo canal that was much too skinny to sail through. We had to turn back north. Just past the swing bridge was a small marina, but it was far too shallow for us. The meant the closest place was Roanoke Island, which was north and then east. We turned around and sailed north for a couple of hours and then anchored on the east side of the river. This was different than our previous anchoring experiences because we were anchoring under sail. We couldn’t use the motor to dig in the anchor, so we let out more chain then we would have. We had survived the day. The next morning brought no wind whatsoever; the water was completely flat. We knew we couldn't sail, so we went to a backup plan. We tied the dinghy alongside the boat toward the stern and using it like a tug, pushed the boat along. It worked pretty well even with its only 8HP motor! Once we picked up some speed, we could use the boat’s wheel to steer. 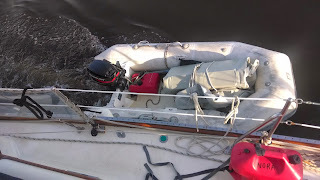 Luckily, we could make the outboard throttle and tiller sticky, which meant we could get out of the dinghy and have it still steer and motor like we wanted it to. The first stressful part of our passage using the dinghy was the Alligator River swing bridge. It turns out that we had nothing to fear though, as we went through without a hitch. The bridge operator timed the opening perfectly. The next obstacle was the treacherous Middle Ground. As we started to go through the narrow channel, our outboard engine slowed down, then died completely. We were freaked out. We thought the outboard was dead, and that we’d have to sail out of the narrow channel. We kept our calm though, and my dad jumped into the dinghy and quickly started it again, to our great relief and we motored through fine. However, the engine died many more times afterward. We're still not sure if the motor was tired out, or there was bad fuel, or something like that. Luckily, it never died when we needed it the most (except for that time in Middle Ground). Later on that day, the wind picked up, and we started sailing. That night, we anchored off Reed's Point. The next morning was the same as the last: no wind at all. We had only the next five or six hours to get to the harbor because of the high winds predicted, so we had to get up and moving very early (it was not pleasant). To get to Manteo Waterfront Marina, we had to enter a thin channel. From there, another led us to the small bay where the Marina was. The two channels were marked differently because the second was one used to get to the marina, and the first one was used to get past the island, or to the second channel. In the first one, we were supposed to keep the green marks to our right. In the second one, we were supposed to keep the red marks to our right. In the intersection of the two channels, there were two temporary marks because of recent shoaling, which made them even narrower. It was unclear, however, which channel they belonged to. 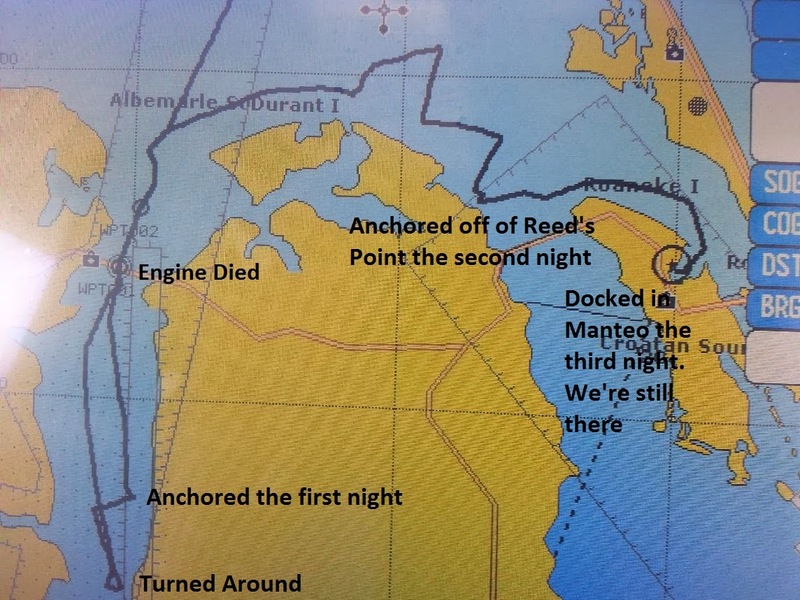 Unfortunately, we chose wrong, cut inside a mark we were supposed to go around, and ran aground. When running aground only a little, the bow raises up. This time, though, both our bow and then our stern raised up, indicating that we were pretty far onto the sand bar. We figured we were done, especially since we only had a dinghy motor. I was the dinghy guy, so I got in the dinghy to try pull us off. We moved the dinghy to the back of the boat, and I blasted on the motor. Surprisingly, we pulled off with no problem. But we were also pointed straight across the narrow channel. By this time, a passing Coast Guard skiff had stopped to watch. We quickly moved the dinghy back to the side and started to push the boat. Unfortunately, we couldn’t steer the boat straight until we had speed, but we couldn’t get speed because we were facing across the channel. The answer was to move the dinghy up to the bow of the boat so that it pulled instead of pushed. This took us safely back into the channel and we quickly moved the dinghy back to the side. Now we had to dock, sometimes a tough thing to do even with the normal boat engine. 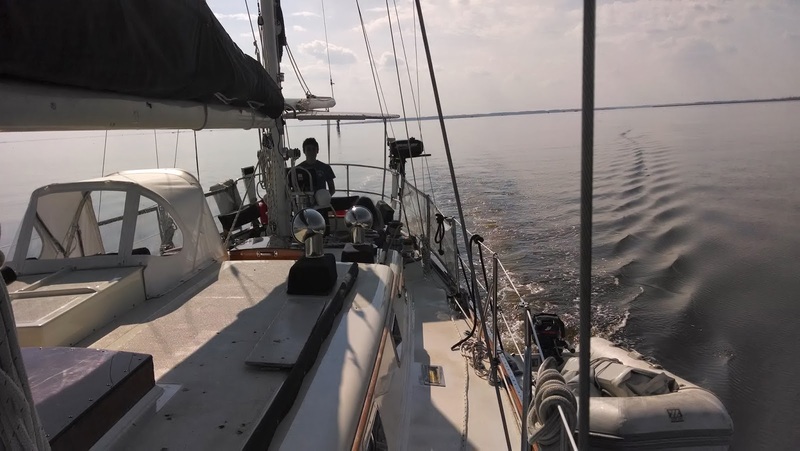 The easiest place to dock was a slip straight ahead, which the marina let us take. Our plan was to come into the slip, using me to slow the boat down a bit (only a bit, because reversing with the dinghy pushed the stern to starboard), and using a spring line to slow the boat down the rest of the way. That was our plan. Time to see if it worked. We came straight on toward the slip, and not very far away, we realized three things. One – the wind was rising, and we were moving 1-1/2 knots under wind alone even with no sails. 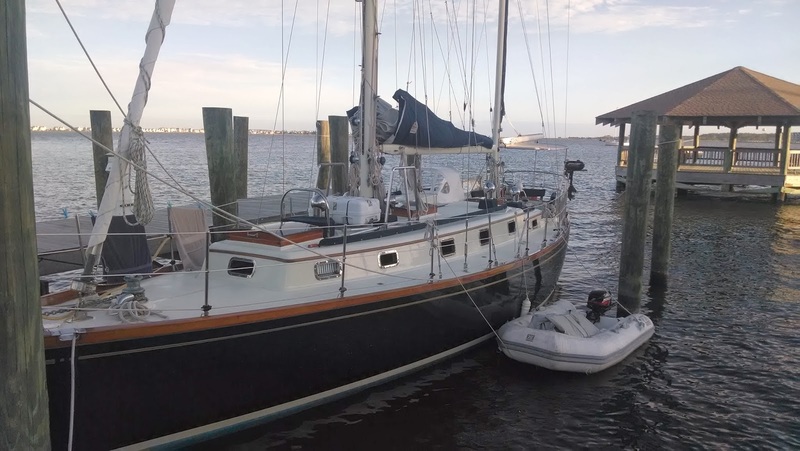 Two – we would have to steer very carefully to keep our shrouds (cables attached to the mast) from snagging on a gazebo-dock structure fast approaching on the left. The boat in the slip. Notice the gazebo behind it. We secured the boat, then went to inspect the damage. Surprisingly, there was not that much damage. This is a strong boat, and the dock hands did a great job. So here we are, in Manteo. We can’t leave without a working engine. The local mechanics are very busy, so my dad is fixing it himself. We're glad we came here, as it's a very nice and interesting place. There are museums about the lost colony of Roanoke, and everyone here is very nice. There was a huge Halloween party, which involved games, free food, and kids from all over the place. Overall, there's not much damage done to the boat, except for the engine, and we've docked in a really cool place, so I'm happy. Patience and perseverence and fun: that is what comes through the posts from all of you. Very impressive. Also, you need a t-shirt that says "I'm the dinghy guy". What a well-written account of a perilous adventure at sea (well, at... on the way to sea). Hope the repairs happen quickly so you can get on with your travels and report back with more stories! Hi Greg, This is Ashwin. Visited your blog this AM. Looks like your adventure is already underway. 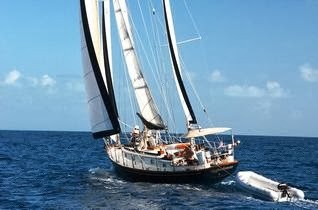 I probably will never sail so will experience it vicariously via your blog. Good luck and stay safe and dry :). My hellos to the rest of the crew.